Here’s a lovely photo of the Earth’s shadow, which can be seen any clear evening ascending in the eastern sky at exactly the same rate that the sun sets below the western horizon. The shadow is a deep blue-grey – darker than the blue of the twilight sky. The pink band above the shadow is called the Belt of Venus. The shadow of the Earth is big. You might have to turn your head to see the whole thing. The shadow is curved, in just the same way that the whole Earth is curved. Earth’s shadow extends hundreds of thousands of miles into space, so far that it can touch the moon. Whenever that happens, there is an eclipse of the moon. Check out Earth’s shadow – in the east at sunset – next time you have a clear sky. I often see it while out on the streets of my town as the sun is setting. By the way, this image shows more or less the same moon phase that you will see tonight. It will be a waxing gibbous moon that will be visible in the east after sunset this evening. Full moon will come on May 17, 2011. 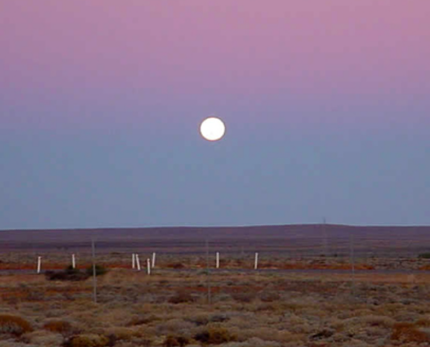 This image is the full moon at the Woomera missile range in Australia. Used with permission. Site contents copyright © 2019 Recorder Online	except as noted. All rights reserved. | 81 queries in 1.188 seconds.